300 million years ago, a vast ocean covered an area that became the Himalayan mountain range. The salt from that ocean was preserved as large crystal formations, which now yield the purest salt on earth. Bio-energetically "alive", this crystal salt contains the same 84 key trace minerals as our bodies, so it is easily metabolized. 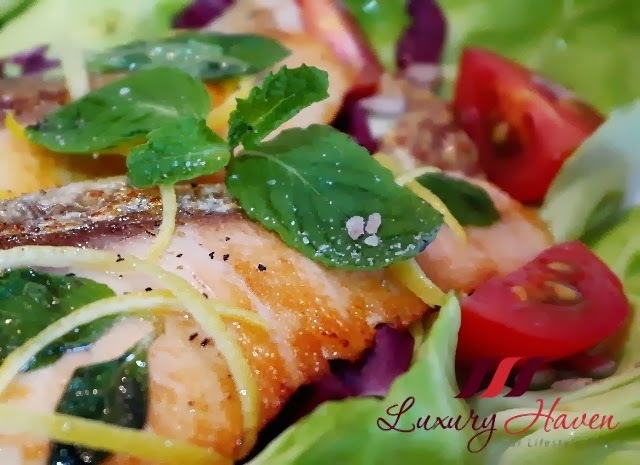 I'd prepared an uplifting and Healthy Pan-seared Salmon Salad, drenched in mint and lemon zest dressing with the Aloha Bay Himalayan Crystal Salt I found at #Vitacost. 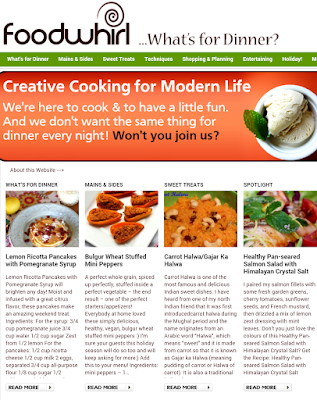 I was so fascinated by the beautiful pink rock salt, and placed an order in my monthly shopping with Vitacost. 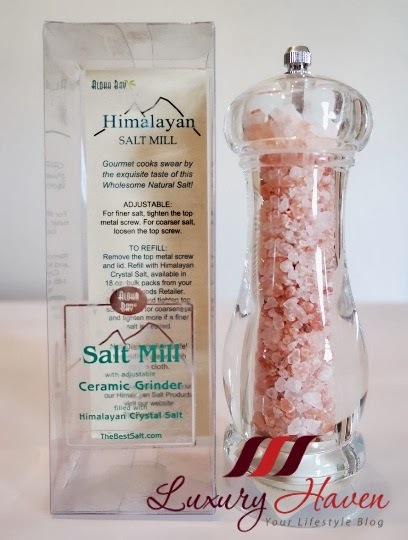 #AlohaBay Himalayan Table and Cooking Salt Mill comes in a classy 7" tall ceramic grinder. The hand-crushed salt is pinkish in colour due to the minerals it contains. No additives. Gourmet cooks swear by the exquisite taste of this Wholesome Natural Salt! It's also easy to use. For finer salt, tighten the top metal screw. For courser salt, loosen the top screw. Retail: USD 18.99, Vitacost: USD 11.99, You Save: 36%!! I love adding mint leaves and lemon zest to my food as it adds flavours to my dishes and drinks, or it can be used as a garnish too. I paired my salmon fillets with some fresh garden greens, cherry tomatoes, sunflower seeds, and French mustard, then drizzled a mix of lemon zest dressing with mint leaves. 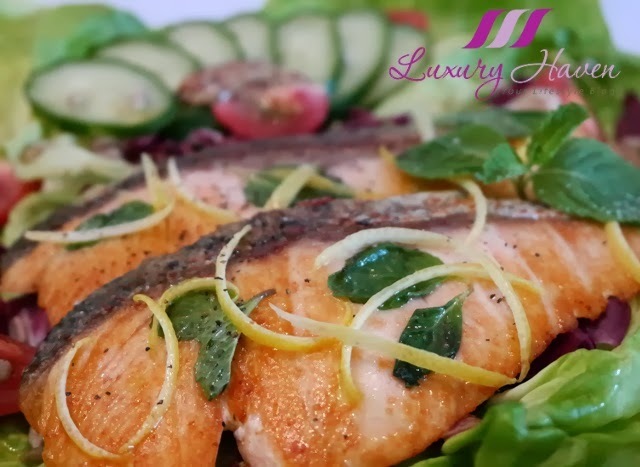 Don't you just love the colours of this Healthy Pan-seared Salmon Salad with #Himalayan Crystal Salt? I'm in love with my pinky rock salt! 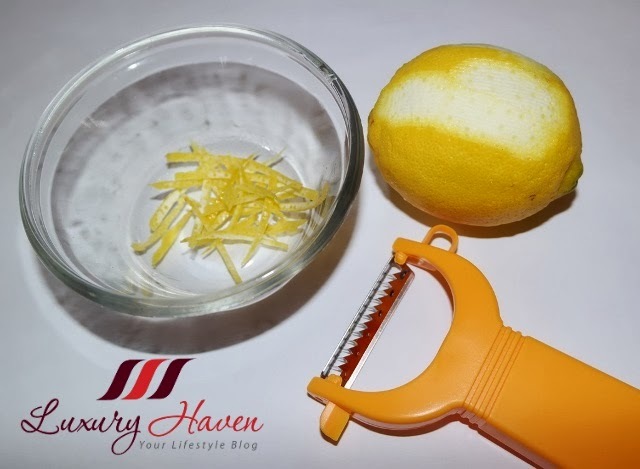 Using a vegetable peeler, grate lemon and set aside. Pour olive oil into a bowl. 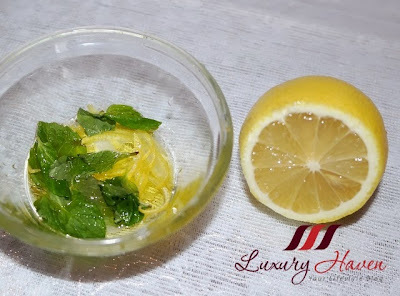 Add lemon juice, and mint leaves. Mix well. Sprinkle salt lightly on salmon. Rub some cornflour on the skin. Heat oil, and pan fry fish with skin side down. 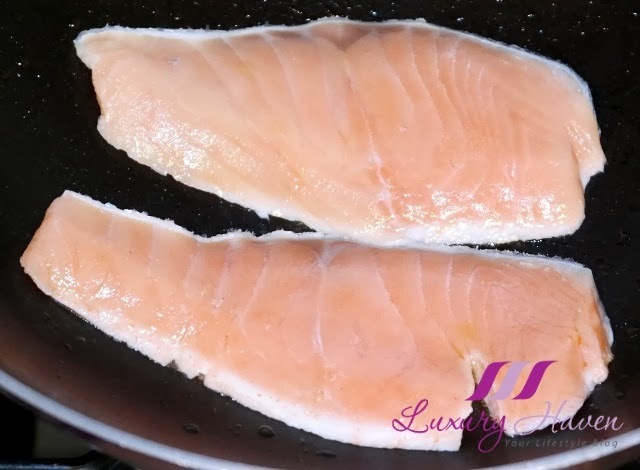 Fry on med-high fire to give salmon a golden brown colour with crispy skin, yet keeping the insides ¾ cooked for a juicy texture. Turn over after couple of minutes, and transfer to salad. 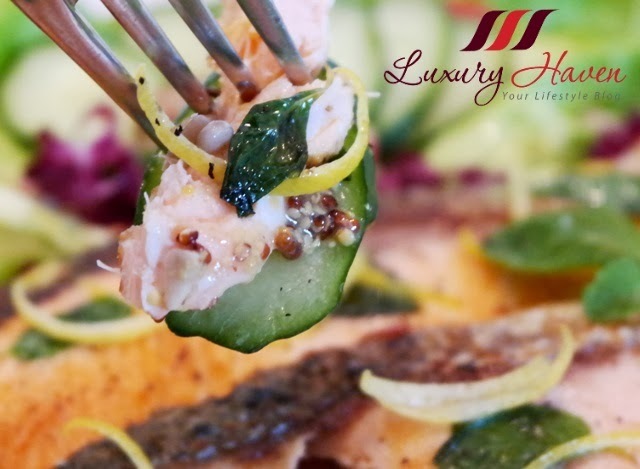 Drizzle your mint and lemon zest dressing over your fish, then grind your black pepper and Himalayan salt for a flavourful Pan-seared Salmon Salad. Look at how tender the fish fillet turned out! The salad tastes great with French Mustard too! 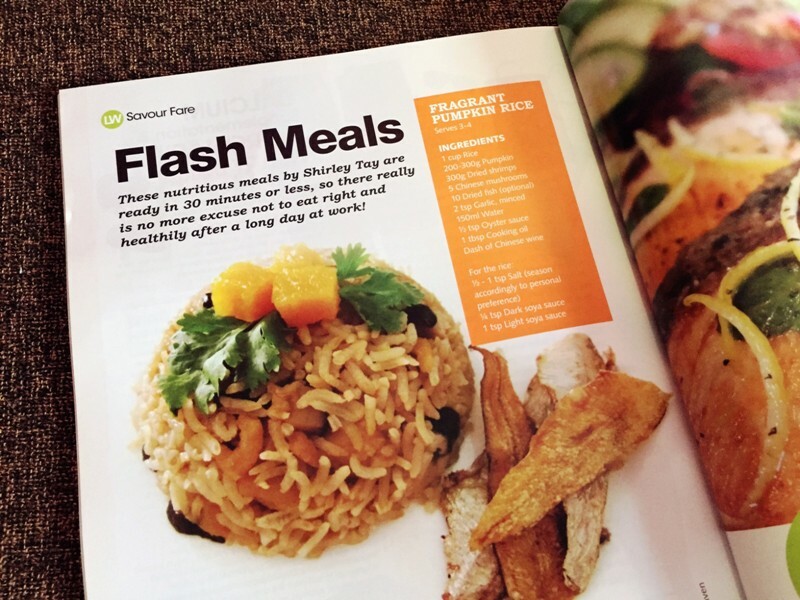 I am humbled that my Pan-Seared Salmon Recipe is Featured at LiveWell Magazine along with 3 other of my recipes! 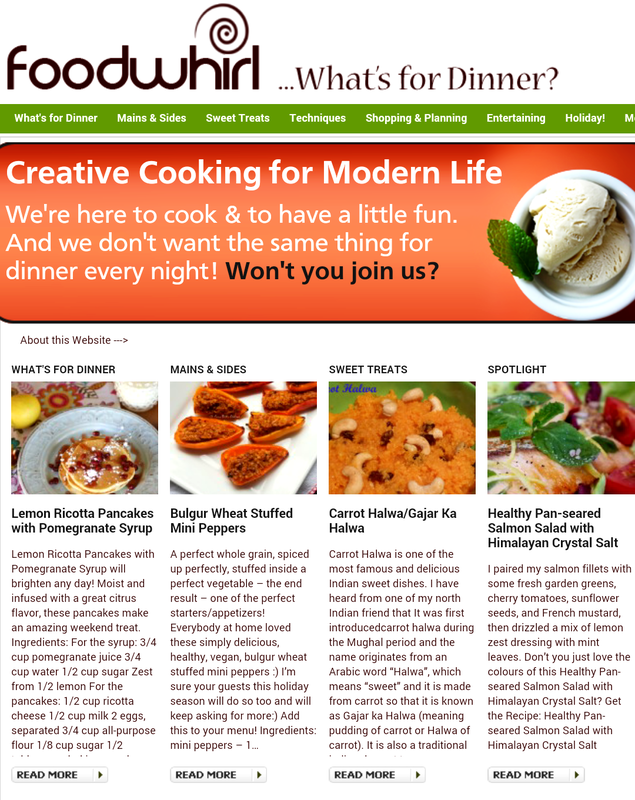 Check them out now and get cooking! Retail: USD 4.59, Vitacost: USD 3.69, You Save: 19%! Vitacost Resveratrol + Grape Seed & Red Wine Extracts (240 Capsules) @ USD 21.99. This is a repeat order; click on the link to read more. Retail: USD 7.49, Vitacost: USD 4.99, You Save: 33%!! Retail: USD 20.99, Vitacost: USD 13.69, You Save: 34%!! My December Vitacost review had been delayed due to the long wait despite my priority shipping. 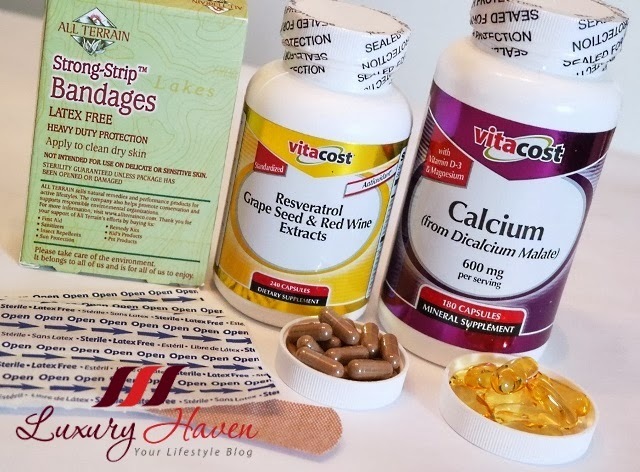 I've been shopping at Vitacost for more than a year now, and had always chosen the USD 13.99 option for weight below 3.41 lbs, just a dollar extra for DHL Priority Shipping, which normally arrives in about a week or so. Probably due to the festive period, my orders took 3 weeks to reach me this time. Nonetheless, my experience with them has always been good. Vitacost ships to over 170 countries! You may wanna start your shopping adventures with them too. Looks fantastic, Shirley!!! Have a great day, my friend! Liz, thanks & you too! Kathy, hope you'll get to try it too! 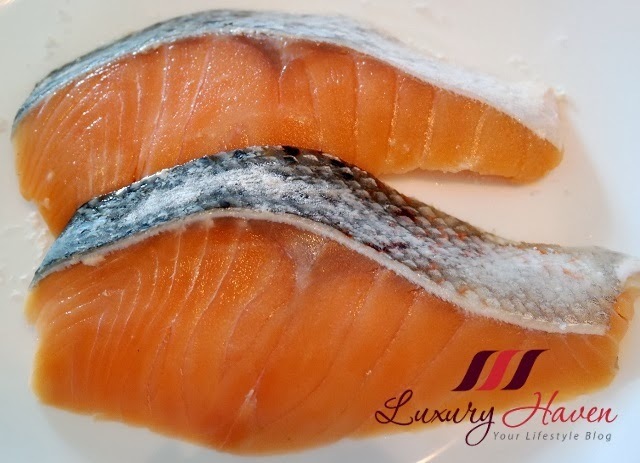 I have not yet tried that himalayan salt and the salmon looks mouth watering. Subha, start shopping for yours now to discover this beautiful salt! Looks delicious! And I'm definitely attracted to the salt mill. You always have good recommendation, shall keep this in mind for my next order from Vitacost. DS, the fact that it comes in a salt mill is so handy. Have fun shopping at Vitacost again! Good post. yummy dish ! I'm drooling all ovemy keyboard looking at your delicious Salmon. Yummm! Shirley, I'm enjoying my Himalayan salt even more now that you've shown how good it is for me. :) (I bought it for the flavor -- ever the foodie! -- but greatly appreciated the nutritional information you shared.) Thank you. 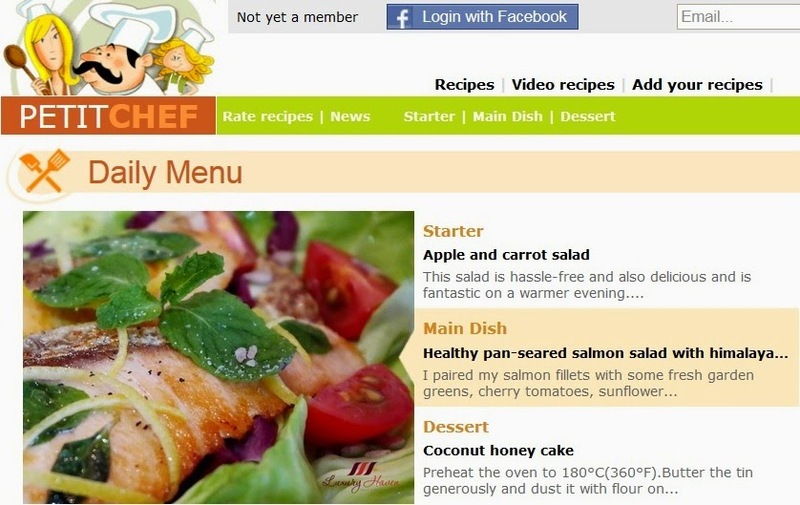 That salt mill is a work of art and your salmon & salad recipe is a MUST make! Kim, that salt mill is lovely, isn't it? Thanks so much for marking this, & do let me know the outcome! ML, it's my son's fave too! i am using the Himalayan salt. is very good. 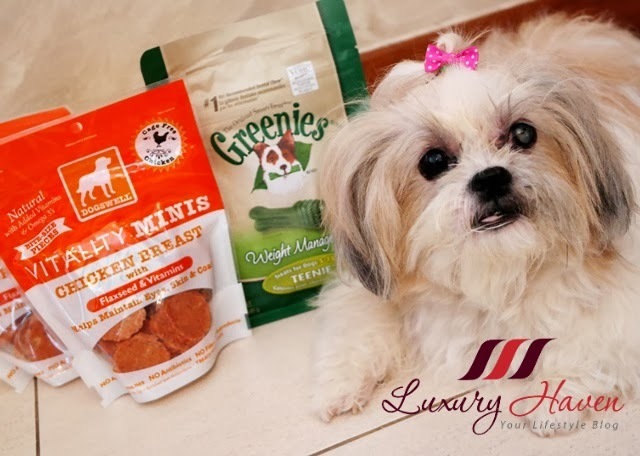 Cquek, thanks so much for sharing! Monica, thanks for coming by! Always love your recipe, all your food are so presentable.. Must be yummy! Kylie, that's so sweet of you! Thanks, dear! Hmm... Salt with nice colour " Pink ".. and with lots of minerals..
" Pink of Health "!! EH, the colour is gorgeous, isn't it? Am also using the salt and its definitely healthy. And the delicious salmon, double healthy all the way. Nava, toast to a healthy life! 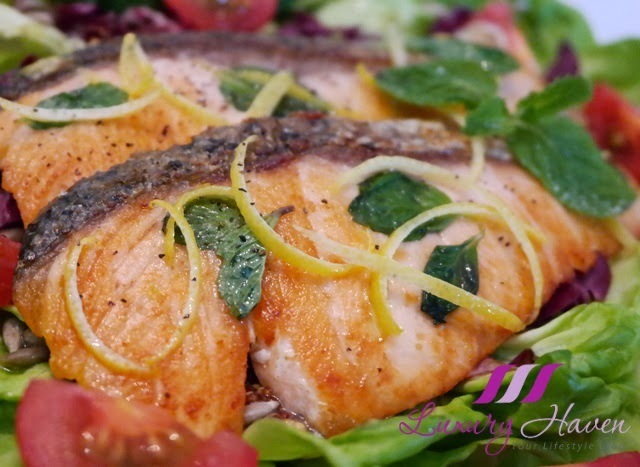 Love salmon and love all the flavors that you have used in pan roasting this. Thanks for sharing the recipe and salt. I am vary that I should not eat the common salt I have now. I love your cute dog so much! Woof! TM, try this wonderful salt & you'll fall in love with it too! Sharon, hahaha! Glad this caught your attention too! There are so many salts in the market! Tried bamboo salt, French salt and Portugese salt. 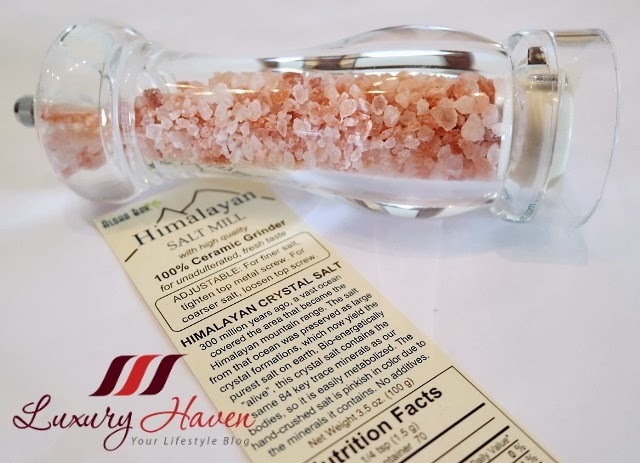 Never try Himalayan salt. I love salmons. Just pan fried is good enough. Rose, I would love to try Truffle Salt!! That pink salt is so pretty! And the salmon looks absolutely delicious.